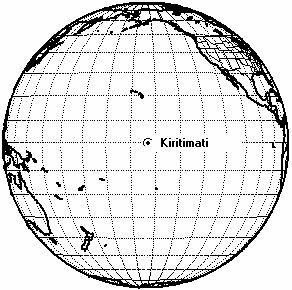 Kiritimati (Christmas Island) in the Pacific Ocean was originally selected by Von Braun in his Collier magazine series of the early 1950's as an ideal equatorial launch site. A half century later, Boeing Sea Launch used an offshore location for orbital launches. The launch platform was a seagoing converted Norwegian offshore oil rig. Between missions it was berthed in Long Beach, California. It was towed to a location off Kiritimati for launches of the Ukrainian Zenit-3 launch vehicle. AKA: Christmas Island (Pacific);Sea Launch. First Launch: 1999-03-28. Last Launch: 2014-05-26. Number: 36 . Location: Kiritimati, Pacific Ocean. Longitude: -154.00 deg. Latitude: 0.00 deg. Apogee: 10 km (6 mi). Minimum Inclination: 0.0 degrees. Maximum Inclination: 180.0 degrees. Family: Orbital Launch Site. Country: USA. Spacecraft: Apstar, FS-1300, HS 601, AS 2100, HS 702, Spacebus 4000, Eurostar 3000. Launch Vehicles: Zenit-3SL. Projects: DirecTV, Galaxy, Intelsat, Thuraya. Agency: Inmarsat, SeaLaunch, Echostar. Bibliography: 2. 1999 March 28 - . 01:29 GMT - . Launch Site: Kiritimati. Launch Pad: 0.0 N x 154.0 W. Launch Platform: Odyssey. LV Family: Zenit. Launch Vehicle: Zenit-3SL. DemoSat - . Payload: HS 702. Mass: 4,500 kg (9,900 lb). Nation: USA. Agency: SeaLaunch. Manufacturer: Kent. Class: Technology. Type: Navigation technology satellite. Spacecraft: HS 702. USAF Sat Cat: 25661 . COSPAR: 1999-014A. Apogee: 36,045 km (22,397 mi). Perigee: 658 km (408 mi). Inclination: 0.70 deg. Period: 645.00 min. The first Boeing Sea Launch mission. The Zenit-3SL lifted off from the Odyssey floating platform on the equator at 154 degrees West longitude. The DemoSat payload was an instrumented dynamic model of an HS-702 satellite built by Boeing Commercial Space/Kent. 13 minutes after launch, the Block DM-SL upper stage completed its first burn and entered a 180 km x 735 km x 1.2 degree parking orbit. A second burn 47 minutes after launch placed DemoSat in a 638 km x 36,064 km x 1.2 degree geostationary transfer orbit. Three hours later, a third DM-SL burn lowered the stage's perigee so that it would re-enter quickly. 1999 October 10 - . 03:28 GMT - . Launch Site: Kiritimati. Launch Pad: 0.0 N x 154.0 W. Launch Platform: Odyssey. LV Family: Zenit. Launch Vehicle: Zenit-3SL. DirecTV 1R - . Payload: HS 601HP. Mass: 3,446 kg (7,597 lb). Nation: USA. Agency: DirecTV. Manufacturer: El Segundo. Program: DirecTV. Class: Communications. Type: Civilian communications satellite. Spacecraft: HS 601 . USAF Sat Cat: 25937 . COSPAR: 1999-056A. Apogee: 35,798 km (22,243 mi). Perigee: 35,774 km (22,228 mi). Inclination: 0.10 deg. Period: 1,436.10 min. Second successful Zenit-3SL flight from the Odyssey launch platform in the Pacific Ocean at 154 deg W, 0 deg N. First flight to carry a commercial payload. The satellite used its R-4D apogee engine to enter geostationary orbit at 81.6 deg W. Finally stationed at 101 deg W. Positioned in geosynchronous orbit at 81 deg W in 1999. As of 5 September 2001 located at 101.19 deg W drifting at 0.004 deg W per day. As of 2007 Mar 10 located at 100.87W drifting at 0.007W degrees per day. 2000 July 28 - . 22:42 GMT - . Launch Site: Kiritimati. Launch Pad: 0.0 N x 154.0 W. Launch Platform: Odyssey. LV Family: Zenit. Launch Vehicle: Zenit-3SL. PAS 9 - . Payload: HS 601HP. Mass: 3,659 kg (8,066 lb). Nation: USA. Agency: Panamsat. Manufacturer: El Segundo. Program: Panamsat. Class: Communications. Type: Civilian communications satellite. Spacecraft: HS 601. USAF Sat Cat: 26451 . COSPAR: 2000-043A. Apogee: 35,796 km (22,242 mi). Perigee: 35,778 km (22,231 mi). Inclination: 0.00 deg. Period: 1,436.10 min. Panamsat geosynchronous communications satellite to replace PAS 5 at 58 deg W. Stationed at 58 deg W. Positioned in geosynchronous orbit at 58 deg W in 2000. As of 30 August 2001 located at 58.03 deg W drifting at 0.012 deg W per day. As of 2007 Mar 9 located at 58.06W drifting at 0.013W degrees per day. 2000 October 21 - . Launch Site: Kiritimati. Launch Pad: 0.0 N x 154.0 W. Launch Platform: Odyssey. LV Family: Zenit. Launch Vehicle: Zenit-3SL. Thuraya 1 - . Payload: BSS-GEM. Mass: 5,108 kg (11,261 lb). Nation: UAE. Agency: Thuraya. Manufacturer: El Segundo. Program: Thuraya. Class: Communications. Type: Civilian communications satellite. Spacecraft: HS 702. USAF Sat Cat: 26578 . COSPAR: 2000-066A. Apogee: 35,808 km (22,250 mi). Perigee: 35,764 km (22,222 mi). Inclination: 5.20 deg. Period: 1,436.10 min. Mobile Communications satellite. Launch delayed from September 18 and October 19. Stationed at 44 deg E. The first Boeing GEM satellite, Thuraya 1, was built by Boeing/El Segundo (formerly Hughes). It was based on the HS-702 design but featured a large 12-m diameter truss antenna for L-band mobile telephone service. Launch mass of Thuraya was 5108 kg; dry mass probably around 3000 kg. The satellite was to be delivered after on orbit testing to Etisalat, the Emirates Telecom Corp of Abu Dhabi, and its Thuraya Satellite subsidiary. Thuraya was launched from the Odyssey platform in the Pacific Ocean positioned on the equator at 154 deg W. The two-stage Yuzhnoe Zenit core delivered Thuraya and its Energiya Blok DM-SL upper stage to a -2212 x 182 km suborbital trajectory. The first DM-SL burn placed the stack in a 180 x 200 km x 6.3 deg parking orbit at 0604 GMT; a second burn at 0733 GMTput Thuraya in a 210 x 35891 km x 6.3 deg geostationary transfer orbit. A later depletion burn lowered the DM-SL stage perigee to 180 km, as burns by Thuraya's liquid engine raised it towards geosynchronous orbit. Positioned in geosynchronous orbit at 44 deg E in 2000. As of 5 September 2001 located at 44.22 deg E drifting at 0.003 deg E per day. As of 2007 Mar 11 located at 98.57E drifting at 0.007W degrees per day. 2001 March 18 - . Launch Site: Kiritimati. Launch Pad: 0.0 N x 154.0 W. Launch Platform: Odyssey. LV Family: Zenit. Launch Vehicle: Zenit-3SL. XM-2 Rock - . Mass: 4,666 kg (10,286 lb). Nation: USA. Agency: XM Radio. Manufacturer: El Segundo. Program: XM. Class: Communications. Type: Civilian communications satellite. Spacecraft: HS 702. USAF Sat Cat: 26724 . COSPAR: 2001-012A. Apogee: 35,788 km (22,237 mi). Perigee: 35,785 km (22,235 mi). Inclination: 0.00 deg. Period: 1,436.10 min. The XM Radio satellites (using Boeing 702 buses) provided digital radio entertainment broadcast to the US. The XM-2 Rock satellite was accompanied by the XM-1 Roll spacecraft launched later in 2001. A Boeing Sea Launch Zenit-3SL took off from the Odyssey floating launch platform at 154W 0 N in the Pacific. The two-stage Zenit put the Blok DM in a suborbital trajectory with a 190 km apogee; the DM first burn went to a 180 x 990 km x 1.3 deg orbit, with the second burn delivering Rock to geostationary transfer orbit. The 4.7 tonne (with fuel), 18 kW satellite carried two transmitters (3 kW each) in the S-band to relay 100 channels of digital quality music uplinked in the X-band from one or more ground stations. It was parked over 114.9 deg-W longitude. The investors include several auto manufacturers who were to be equipping the special receivers in their models. As of 4 September 2001 located at 114.98 deg W drifting at 0.001 deg W per day. As of 2007 Mar 10 located at 115.14W drifting at 0.003W degrees per day. 2001 May 8 - . 22:10 GMT - . Launch Site: Kiritimati. Launch Pad: 0.0 N x 154.0 W. Launch Platform: Odyssey. LV Family: Zenit. Launch Vehicle: Zenit-3SL. XM-1 Roll - . Mass: 3,703 kg (8,163 lb). Nation: USA. Agency: XM Radio. Manufacturer: El Segundo. Program: XM. Class: Communications. Type: Civilian communications satellite. Spacecraft: HS 702. USAF Sat Cat: 26761 . COSPAR: 2001-018A. Apogee: 35,790 km (22,230 mi). Perigee: 35,784 km (22,235 mi). Inclination: 0.00 deg. Period: 1,436.10 min. Direct Radio Broadcasting satellite. Second launch attempt following pad abort on January 8. Launch delayed from May 7. XM-1 "Roll" was launched from Sea Launch's Odyssey Launch Platform in the Pacific, on the equator at 154.0 W. Roll joined Rock, launched on March 18, to complete the XM Satellite Radio space segment. The XM-1 satellite was a Boeing Satellite Systems (El Segundo) BSS 702 with a launch mass of 4667 kg and a dry mass of about 2500 kg. It carried an R-4D liquid apogee engine and a XIPS ion station-keeping engine. The satellite's Alcatel communications payload featured an X-band receive antenna which passed digital radio broadcasts on to the two 5-meter S-band transmit antennas. It was to provide one hundred channels of digital music and entertainment to motorists in North America after parking over 85 deg-W. The XM satellites, like the three rival Sirius Radio satellites in inclined elliptical synchronous orbits, were to provide radio broadcasting to North America. The first two stages of the Zenit launch vehicle placed the Block DM-SL upper stage and payload in a 191 km apogee suborbital trajectory at 2219 GMT; the Block-DM-SL then ignited for its first burn, entering a 180 x 990 km x 1.3 deg parking orbit at 2223 GMT. The second burn at 2258 GMT accelerated the stack to a 935 x 35797 km x 1.3 deg geostationary transfer orbit. The XM-1 Roll satellite separated at 2315 GMT. As of 5 September 2001 located at 85.12 deg W drifting at 0.009 deg W per day. As of 2007 Mar 10 located at 115.09W drifting at 0.002W degrees per day. 2002 June 15 - . 22:39 GMT - . Launch Site: Kiritimati. Launch Pad: 0.0 N x 154.0 W. Launch Platform: Odyssey. LV Family: Zenit. Launch Vehicle: Zenit-3SL. Galaxy 3C - . Mass: 4,850 kg (10,690 lb). Nation: USA. Agency: PanAmSat. Manufacturer: El Segundo. Program: Galaxy. Class: Communications. Type: Civilian communications satellite. Spacecraft: HS 702. USAF Sat Cat: 27445 . COSPAR: 2002-030A. Apogee: 35,788 km (22,237 mi). Perigee: 35,786 km (22,236 mi). Inclination: 0.10 deg. Period: 1,436.10 min. Launch delayed from July 2001 and May 28, June 2 and 9, 2002. The Galaxy 3C satellite was launched from the Odyssey floating launch platform at its standard 154W 0N location. The Zenit second stage and the DM third stage with payload entered a -2160 x 195 km suborbital trajectory at 2248:10. At about 2252 UTC the DM stage entered a 180 x 393 km x 0 deg parking orbit. A second burn of the DM at 2324 to 2330 UTC put Galaxy 3C in a 358 x 41440 km x 0.02 deg transfer orbit This was a record low inclination for a geostationary transfer orbit. The satellite's R-4D apogee engine was to put the Boeing BSS-702 satellite in geostationary orbit. The satellite was the first 702 model to use extra solar panels instead of the solar concentrators which ran into fogging problems on the earlier 702 flights. As of 2007 Mar 10 located at 95.06W drifting at 0.007W degrees per day. 2003 June 10 - . Launch Site: Kiritimati. Launch Pad: 0.0 N x 154.0 W. Launch Platform: Odyssey. LV Family: Zenit. Launch Vehicle: Zenit-3SL. Thuraya 2 - . Payload: BSS-GEM. Mass: 5,177 kg (11,413 lb). Nation: UAE. Agency: Thuraya. Manufacturer: El Segundo. Program: Thuraya. Class: Communications. Type: Civilian communications satellite. Spacecraft: HS 702. USAF Sat Cat: 27825 . COSPAR: 2003-026A. Apogee: 35,806 km (22,248 mi). Perigee: 35,766 km (22,223 mi). Inclination: 5.00 deg. Period: 1,436.10 min. The Boeing 'GEM' spacecraft was a modified BSS-702 with a 12 m wide antenna for L-band mobile communications. Launch delayed from January 20, then April 4. As of 2007 Mar 9 located at 43.94E drifting at 0.004E degrees per day..
2003 August 8 - . 03:31 GMT - . Launch Site: Kiritimati. Launch Pad: 0.0 N x 154.0 W. Launch Platform: Odyssey. LV Family: Zenit. Launch Vehicle: Zenit-3SL. Echostar 9 (Telstar 13) - . Mass: 4,737 kg (10,443 lb). Nation: USA. Agency: PanAmSat. Program: Echostar. Class: Communications. Type: Civilian communications satellite. Spacecraft: FS-1300. USAF Sat Cat: 27854 . COSPAR: 2003-034A. Apogee: 35,809 km (22,250 mi). Perigee: 35,764 km (22,222 mi). Inclination: 0.00 deg. Period: 1,436.10 min. Originally to have launched December 2002. Echostar 9 carried a Ku and Ka band communications payload for Echostar, and a C-band payload owned by Loral Skynet but about to be sold to Intelsat. Loral called the satellite Telstar 13. As of 2007 Mar 10 located at 121.04W drifting at 0.007W degrees per day. 2003 October 1 - . 04:03 GMT - . Launch Site: Kiritimati. Launch Pad: 0.0 N x 154.0 W. Launch Platform: Odyssey. LV Family: Zenit. Launch Vehicle: Zenit-3SL. Horizons 1 (Galaxy 13) - . Payload: HS 601HP. Mass: 4,060 kg (8,950 lb). Nation: USA. Agency: PanAmSat. Program: Horizons. Class: Communications. Type: Civilian communications satellite. Spacecraft: HS 601. USAF Sat Cat: 27954 . COSPAR: 2003-044A. Apogee: 35,794 km (22,241 mi). Perigee: 35,779 km (22,231 mi). Inclination: 0.10 deg. Period: 1,436.10 min. Delayed from late 2002, September 27 2003. The satellite carried both C-band and Ku-band communications payloads. The C-band payload was referred to as Galaxy 13; the Ku-band payload was jointly owned by Panamsat and the Japanese JSAT company and was called Horizons-1. Horizons-1 was to provide digital data services between the Americas and Asia via a relay station in Hawaii. As of 2007 Mar 11 located at 127.00W drifting at 0.002E degrees per day. 2004 January 11 - . 04:13 GMT - . Launch Site: Kiritimati. Launch Pad: 0.0 N x 154.0 W. Launch Platform: Odyssey. LV Family: Zenit. Launch Vehicle: Zenit-3SL. Estrela do Sul 1 (Skynet Brazil 1, Telstar 14) - . Mass: 4,694 kg (10,348 lb). Nation: Brazil. Agency: Skynet Palo Alto. Class: Communications. Type: Civilian communications satellite. Spacecraft: FS-1300. USAF Sat Cat: 28137 . COSPAR: 2004-001A. Apogee: 35,794 km (22,241 mi). Range: 0 km (0 mi). Perigee: 35,779 km (22,231 mi). Period: 1,436.10 min. Initially planned for launch on Delta 4M+ (4,2). Launch delayed from January 10. Placed in geosynchronous orbit but reports indicated there were problems deploying one of the solar panels. As of 2007 Mar 11 located at 63.07W drifting at 0.006W degrees per day. 2004 May 4 - . 12:42 GMT - . Launch Site: Kiritimati. Launch Pad: 0.0 N x 154.0 W. Launch Platform: Odyssey. LV Family: Zenit. Launch Vehicle: Zenit-3SL. DirecTV 7S - . Mass: 5,483 kg (12,087 lb). Nation: USA. Agency: DirecTV. Manufacturer: Palo Alto. Program: DirecTV. Class: Communications. Type: Civilian communications satellite. Spacecraft: FS-1300. USAF Sat Cat: 28238 . COSPAR: 2004-016A. Apogee: 35,792 km (22,240 mi). Perigee: 35,730 km (22,200 mi). Inclination: 0.00 deg. Period: 1,434.80 min. Delayed from February 29, May 2. Transferred from Ariane 5 under launch backup agreement. Record single payload to geosynchronous transfer orbit. As of 2007 Mar 11 located at 119.04W drifting at 0.000E degrees per day..
2004 June 29 - . 03:58 GMT - . Launch Site: Kiritimati. Launch Pad: 0.0 N x 154.0 W. Launch Platform: Odyssey. LV Family: Zenit. Launch Vehicle: Zenit-3SL. FAILURE: Partial failure - upper stage left satellite stranded in useless orbit.. Failed Stage: 3. Apstar 5 - . Payload: Apstar 1R, Telstar 18, LS-1300. Mass: 4,640 kg (10,220 lb). Nation: China. Agency: APT Satellite Company. Manufacturer: Palo Alto. Program: Apstar. Class: Communications. Type: Civilian communications satellite. Spacecraft: FS-1300. USAF Sat Cat: 28364 . COSPAR: 2004-024A. Apogee: 35,799 km (22,244 mi). Perigee: 35,775 km (22,229 mi). Inclination: 0.10 deg. Period: 1,436.10 min. Delayed from November 2003, April 28 2004. Partial failure (upper stage). As of 2007 Mar 11 located at 138.01E drifting at 0.009W degrees per day..
2005 March 1 - . 03:51 GMT - . Launch Site: Kiritimati. Launch Pad: 0.0 N x 154.0 W. Launch Platform: Odyssey. LV Family: Zenit. Launch Vehicle: Zenit-3SL. XM-3 - . Payload: XM Rhythm. Mass: 4,703 kg (10,368 lb). Nation: USA. Agency: XM Radio. Manufacturer: El Segundo. Program: XM. Class: Communications. Type: Civilian communications satellite. Spacecraft: HS 702. USAF Sat Cat: 28626 . COSPAR: 2005-008A. Apogee: 35,789 km (22,238 mi). Perigee: 35,785 km (22,235 mi). Inclination: 0.00 deg. Period: 1,436.10 min. Delayed from February 17, 18 and 23, 2005 due to of heavy seas. The satellite would supplement the American XM network's satellite direct-broadcast digital radio service. As of 2007 Mar 9 located at 85.14W drifting at 0.010W degrees per day..
2005 April 26 - . 07:31 GMT - . Launch Site: Kiritimati. Launch Pad: 0.0 N x 154.0 W. Launch Platform: Odyssey. LV Family: Zenit. Launch Vehicle: Zenit-3SL. Spaceway 1 - . Mass: 6,080 kg (13,400 lb). Nation: USA. Agency: DirecTV. Manufacturer: El Segundo. Program: DirecTV. Class: Communications. Type: Civilian communications satellite. Spacecraft: HS 702. USAF Sat Cat: 28644 . COSPAR: 2005-015A. Apogee: 35,789 km (22,238 mi). Perigee: 35,785 km (22,235 mi). Inclination: 0.00 deg. Period: 1,436.10 min. Heaviest single payload to geosynchronous transfer orbit to that date. Carried 48 high-frequency Ka-band transponders for data transmission and television broadcasting. As of 2007 Mar 10 located at 102.80W drifting at 0.005W degrees per day..
2005 June 23 - . 14:03 GMT - . Launch Site: Kiritimati. Launch Pad: 0.0 N x 154.0 W. Launch Platform: Odyssey. LV Family: Zenit. Launch Vehicle: Zenit-3SL. Intelsat Americas 8 - . Payload: Telstar 8. Mass: 5,500 kg (12,100 lb). Nation: USA. Agency: Intelsat. Manufacturer: Palo Alto. Program: Intelsat. Class: Communications. Type: Civilian communications satellite. Spacecraft: FS-1300. USAF Sat Cat: 28702 . COSPAR: 2005-022A. Apogee: 35,795 km (22,241 mi). Perigee: 35,779 km (22,231 mi). Inclination: 0.10 deg. Period: 1,436.10 min. Delayed since 2002; most recently delayed from December 4 and 17, 2004. Communications satellite with Ku-, C- and Ka-band transponders, owned by Intelsat, which had been privatized. As of 2007 Mar 11 located at 89.01W drifting at 0.007W degrees per day..
2005 November 8 - . 14:07 GMT - . Launch Site: Kiritimati. Launch Pad: 0.0 N x 154.0 W. Launch Platform: Odyssey. LV Family: Zenit. Launch Vehicle: Zenit-3SL. Inmarsat-4 F2 - . Payload: Inmarsat 4B / Eurostar 3000GM. Mass: 5,958 kg (13,135 lb). Nation: International. Agency: Inmarsat. Program: Inmarsat. Class: Communications. Type: Civilian communications satellite. Spacecraft: Eurostar 3000. USAF Sat Cat: 28899 . COSPAR: 2005-044A. Apogee: 35,965 km (22,347 mi). Perigee: 35,902 km (22,308 mi). Inclination: 2.90 deg. Period: 1,443.60 min. The satellite was fitted with a 10 meter diameter antenna for mobile communications. Payload moved from Ariane 5 EC-A. Launch delayed from September, November 4 and 5, 2005. As of 2007 Mar 11 located at 52.87W drifting at 0.010W degrees per day..
2006 February 15 - . 23:35 GMT - . Launch Site: Kiritimati. Launch Pad: 0.0 N x 154.0 W. Launch Platform: Odyssey. LV Family: Zenit. Launch Vehicle: Zenit-3SL. Echostar 10 - . Payload: A2100AXS. Mass: 4,333 kg (9,552 lb). Nation: USA. Agency: PanAmSat. Manufacturer: Lockheed. Program: Echostar. Class: Communications. Type: Civilian communications satellite. Spacecraft: AS 2100. USAF Sat Cat: 28935 . COSPAR: 2006-003A. Apogee: 35,794 km (22,241 mi). Perigee: 35,780 km (22,230 mi). Inclination: 0.00 deg. Period: 1,436.10 min. Ku-band communications payload; station in geosynchronous orbit at 110.17 deg W. As of 2007 Mar 11 located at 110.21W drifting at 0.004W degrees per day..
2006 April 12 - . 23:30 GMT - . Launch Site: Kiritimati. Launch Pad: 0.0 N x 154.0 W. Launch Platform: Odyssey. LV Family: Zenit. Launch Vehicle: Zenit-3SL. JCSAT 9 - . Payload: A2100AX. Mass: 4,401 kg (9,702 lb). Nation: Japan. Agency: JSAT. Manufacturer: Lockheed. Program: JCSAT. Class: Communications. Type: Civilian communications satellite. Spacecraft: AS 2100. USAF Sat Cat: 29045 . COSPAR: 2006-010A. Apogee: 35,790 km (22,230 mi). Perigee: 35,785 km (22,235 mi). Inclination: 0.00 deg. Period: 1,436.10 min. As of 2007 Mar 8 located at 132.01E drifting at 0.014W degrees per day..
2006 June 18 - . 07:50 GMT - . Launch Site: Kiritimati. Launch Pad: 0.0 N x 154.0 W. Launch Platform: Odyssey. LV Family: Zenit. Launch Vehicle: Zenit-3SL. Galaxy 16 - . Payload: LS-1300X. Mass: 4,640 kg (10,220 lb). Nation: USA. Agency: PanAmSat. Manufacturer: Palo Alto. Program: Galaxy. Class: Communications. Type: Civilian communications satellite. Spacecraft: FS-1300. USAF Sat Cat: 29236 . COSPAR: 2006-023A. Apogee: 35,799 km (22,244 mi). Perigee: 35,774 km (22,228 mi). Inclination: 0.0200 deg. Period: 1,436.11 min. As of 2007 Mar 11 located at 98.98W drifting at 0.005W degrees per day..
2006 August 22 - . 03:27 GMT - . Launch Site: Kiritimati. Launch Pad: 0.0 N x 154.0 W. Launch Platform: Odyssey. LV Family: Zenit. Launch Vehicle: Zenit-3SL. Koreasat 5 - . Payload: Mugunghwa 5, Spacebus 4000C1. Mass: 4,465 kg (9,843 lb). Nation: Korea South. Agency: KT. Manufacturer: Alenia. Program: Koreasat. Class: Communications. Type: Civilian communications satellite. Spacecraft: Spacebus 4000. USAF Sat Cat: 29349 . COSPAR: 2006-034A. Apogee: 35,795 km (22,241 mi). Perigee: 35,780 km (22,230 mi). Inclination: 0.00 deg. Period: 1,436.20 min. The satellite will was to provide Ku-band service for Korea Telecom and Ka-band and SHF band transponders for the South Korean Agency for Defense Development. As of 2007 Mar 11 located at 113.05E drifting at 0.012W degrees per day..
2006 October 30 - . 23:49 GMT - . Launch Site: Kiritimati. Launch Pad: 0.0 N x 154.0 W. Launch Platform: Odyssey. LV Family: Zenit. Launch Vehicle: Zenit-3SL. XM-Blues - . Mass: 6,100 kg (13,400 lb). Nation: USA. Agency: XM Radio. Manufacturer: El Segundo. Program: XM. Class: Communications. Type: Civilian communications satellite. Spacecraft: HS 702. USAF Sat Cat: 29520 . COSPAR: 2006-049A. Apogee: 35,787 km (22,236 mi). Perigee: 35,785 km (22,235 mi). Inclination: 0.00 deg. Period: 1,436.09 min. Adds to XM Satellite Radio's constellation of direct-broadcast radio to North America (XM Rock, Roll, and Rhythm launched earlier). As of 2007 Mar 10 located at 115.02W drifting at 0.006W degrees per day..
2007 January 30 - . 23:22 GMT - . Launch Site: Kiritimati. Launch Pad: 0.0 N x 154.0 W. Launch Platform: Odyssey. LV Family: Zenit. Launch Vehicle: Zenit-3SL. FAILURE: First stage exploded just after ignition, damaging launch platform.. Failed Stage: 1. NSS 8 - . Mass: 6,100 kg (13,400 lb). Nation: Netherlands. Agency: New Skies. Manufacturer: El Segundo. Program: Intelsat. Class: Communications. Type: Civilian communications satellite. Spacecraft: HS 702. The platform was designed to survive such an explosion, but the flame deflector was blown off and the blast doors unhinged. The launch platform was towed back to Long Beach for repairs. The time required to repair the platform and the investigation to determine and fix the cause would certainly impact the 2007 Zenit-3SL and Zenit-2 launch schedules, probably forcing customers to be diverted to other boosters. NSS-8 was to have been placed at a 57� East orbital position to satisfy demand in the Indian Ocean region with 56 C-band and 36 Ku-band transponders. NSS-703, with an expected end-of-life in 2009, would have to continue in service until a replacement was built and launched. 2008 March 19 - . 22:48 GMT - . Launch Site: Kiritimati. Launch Pad: 0.0 N x 154.0 W. Launch Platform: Odyssey. LV Family: Zenit. Launch Vehicle: Zenit-3SL. DirecTV 11 - . Mass: 5,920 kg (13,050 lb). Nation: USA. Agency: DirecTV. Manufacturer: Boeing. Program: DirecTV. Class: Communications. Type: Civilian communications satellite. Spacecraft: HS 702. USAF Sat Cat: 32729 . COSPAR: 2008-013A. Apogee: 35,788 km (22,237 mi). Perigee: 35,787 km (22,236 mi). Inclination: 0.00 deg. Period: 1,436.10 min. Placed in orbital slot 99.2� W Longitude. In combination with DirecTV 10, the satellite would allow the parent company to direct broadcast local HDTV to 90 percent of its customers in North America. The Ka-band satellite was equipped with 28 active and 8 spare TWTAs for direct broadcast to the continental United States and Alaska; 4 active and 4 spare for broadcast to the 48 stages and Hawaii; and 55 active and 15 spares for spot transmissions. Total power was 18 kW / 16 kW at beginning/end of life. Propulsion was provided by 445 N liquid apogee engine and four XIPS 35-cm ion thrusters. Mass at launch was 6060 kg and 3700 kg after on-board propellants were consumed to place the satellite in its operational geosynchronous orbit. 2008 May 21 - . 09:43 GMT - . Launch Site: Kiritimati. Launch Pad: 0.0 N x 154.0 W. Launch Platform: Odyssey. LV Family: Zenit. Launch Vehicle: Zenit-3SL. Galaxy 18 - . Mass: 4,642 kg (10,233 lb). Nation: USA. Agency: Intelsat. Program: Galaxy. Class: Communications. Type: Civilian communications satellite. Spacecraft: FS-1300. USAF Sat Cat: 32951 . COSPAR: 2008-024A. Apogee: 35,799 km (22,244 mi). Perigee: 35,774 km (22,228 mi). Inclination: 0.00 deg. Period: 1,436.10 min. Intelsat communications satellite, located at 123� W as a replacement for Galaxy 10R. 24 C-band, and 24 Ku-band transponders serving North American customers..
2008 July 16 - . 05:20 GMT - . Launch Site: Kiritimati. Launch Pad: 0.0 N x 154.0 W. Launch Platform: Odyssey. LV Family: Zenit. Launch Vehicle: Zenit-3SL. Echostar 11 - . Mass: 5,511 kg (12,149 lb). Nation: USA. Agency: PanAmSat. Manufacturer: Palo Alto. Program: Echostar. Class: Communications. Type: Civilian communications satellite. Spacecraft: FS-1300. USAF Sat Cat: 33207 . COSPAR: 2008-035A. Apogee: 35,799 km (22,244 mi). Perigee: 35,774 km (22,228 mi). Inclination: 0.00 deg. Period: 1,436.10 min. Satellite provided direct television broadcasting services for the North American Dish Network..
2008 September 24 - . 19:28 GMT - . Launch Site: Kiritimati. Launch Pad: 0.0 N x 154.0 W. Launch Platform: Odyssey. LV Family: Zenit. Launch Vehicle: Zenit-3SL. Galaxy 19 - . Mass: 4,690 kg (10,330 lb). Nation: USA. Agency: Intelsat. Program: Galaxy. Class: Communications. Type: Civilian communications satellite. Spacecraft: FS-1300. USAF Sat Cat: 33376 . COSPAR: 2008-045A. Apogee: 35,812 km (22,252 mi). Perigee: 35,643 km (22,147 mi). Inclination: 0.10 deg. Period: 1,433.10 min. 2009 April 20 - . 08:16 GMT - . Launch Site: Kiritimati. Launch Pad: 0.0 N x 154.0 W. Launch Platform: Odyssey. LV Family: Zenit. Launch Vehicle: Zenit-3SL. Sicral 1B - . Payload: Italsat-3000. Mass: 3,038 kg (6,697 lb). Nation: Italy. Agency: SeaLaunch. Class: Communications. Type: Military communications satellite. Spacecraft: Italsat. USAF Sat Cat: 34810 . COSPAR: 2009-020A. Apogee: 35,787 km (22,236 mi). Perigee: 35,785 km (22,235 mi). Inclination: 0.00 deg. Period: 1,436.00 min. Second Italian military communications satellite. Dry mass 1680 kg..
2011 September 24 - . 20:18 GMT - . Launch Site: Kiritimati. Launch Platform: Odyssey. LV Family: Zenit. Launch Vehicle: Zenit-3SL. Atlantic Bird 7 - . Mass: 4,600 kg (10,100 lb). Nation: Europe. Program: Eutelsat. Class: Communications. Type: Civilian communications satellite. Spacecraft: Eurostar 3000. USAF Sat Cat: 37816 . COSPAR: 2011-051A. Apogee: 35,804 km (22,247 mi). Perigee: 35,769 km (22,225 mi). Inclination: 0.10 deg. Period: 1,436.10 min. Eutelsat's communications satellite. First mission by Sea Launch from the Odyssey floating launch platform after emerging from bankruptcy..
2012 June 1 - . 05:23 GMT - . Launch Site: Kiritimati. Launch Platform: Odyssey. LV Family: Zenit. Launch Vehicle: Zenit-3SL. Intelsat 19 - . Payload: Intelsat IS-19. Mass: 5,600 kg (12,300 lb). Nation: Europe. Class: Communications. Type: Communications satellite. Spacecraft: FS-1300. USAF Sat Cat: 38356 . COSPAR: 2012-030A. Apogee: 35,791 km (22,239 mi). Perigee: 35,783 km (22,234 mi). Inclination: 0.10 deg. Period: 1,436.10 min. 2012 August 19 - . 06:55 GMT - . Launch Site: Kiritimati. Launch Platform: Odyssey. LV Family: Zenit. Launch Vehicle: Zenit-3SL. Intelsat IS-21 - . Payload: BSS-702MP. Mass: 5,984 kg (13,192 lb). Nation: Europe. Class: Communications. Type: Communications satellite. Spacecraft: HS 702. USAF Sat Cat: 38749 . COSPAR: 2012-045A. Apogee: 35,789 km (22,238 mi). Perigee: 35,784 km (22,235 mi). Inclination: 0.10 deg. Period: 1,436.10 min. The IS-21 satellite replaced IS-9 and in providing western hemisphere communications satellite coverage..
2012 December 3 - . 20:44 GMT - . Launch Site: Kiritimati. Launch Platform: Odyssey. LV Family: Zenit. Launch Vehicle: Zenit-3SL. Eutelsat 70B - . Mass: 5,250 kg (11,570 lb). Nation: Europe. Class: Communications. Type: Communications satellite. Spacecraft: Eurostar 3000. USAF Sat Cat: 39020 . COSPAR: 2012-069A. Apogee: 35,800 km (22,200 mi). Perigee: 35,774 km (22,228 mi). Inclination: 0.10 deg. Period: 1,436.10 min. Stationed at 70.5 E, with 48 Ku-band transponders..
2013 February 1 - . 06:56 GMT - . Launch Site: Kiritimati. Launch Platform: Odyssey. LV Family: Zenit. Launch Vehicle: Zenit-3SL. FAILURE: A first-stage hydraulic pump failure 4 seconds after launch led to shut down 20 seconds later. The vehicle, with the Intelsat communications satellite, impacted the Pacific Ocean 56 seconds after launch.. Failed Stage: 1. Intelsat IS-27 - . Payload: BSS-702MP. Mass: 6,241 kg (13,759 lb). Nation: USA. Class: Communications. Type: Communications satellite. Spacecraft: HS 702. The lost satellite carried Ku and C band communications transponders and an Italian UHF payload..
2014 May 26 - . 21:10 GMT - . Launch Site: Kiritimati. Launch Pad: SL Odyssey, Pacifi. Launch Platform: Odyssey. LV Family: Zenit. Launch Vehicle: Zenit-3SL. EUTELSAT 3B - . Payload: EUTE 3B. Mass: 5,967 kg (13,154 lb). Nation: Europe. Class: Communications. Type: Communications satellite. Spacecraft: Eurostar 3000. USAF Sat Cat: 39773 . COSPAR: 2014-030A. Apogee: 35,793 km (22,240 mi). Perigee: 35,779 km (22,231 mi). Inclination: 0.0600 deg. Period: 1,436.08 min. Communications satellite with C, Ku and Ka band comms payloads for the Paris-based company Eutelsat S.A..